From time to time I really enjoy highlighting some of my favorite essential oils! When I first got this essential oil I got it for FREE from doTERRA during one of their specials and boy am I glad I did. I apply this blend to my face each night before bed and it has helped my skin so much. Let me tell you a little bit about it! 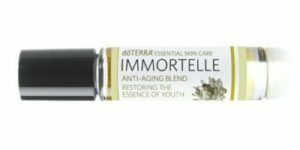 Immortelle is a proprietary blend of powerfully renewing, rare essential oils used throughout history for their beautifying benefits, Immortelle Anti-Aging Blend is formulated to protect and nourish skin while helping to reduce contributing factors to the appearance of aging skin. These powerful essential oils help sustain smoother, more radiant, and youthful-looking skin. Immortelle easily absorbs into the skin and can be used on the face, neck, and décolletage to reduce the appearance of fine lines, wrinkles, and aging skin. It is a combination of Frankincense Resin, Hawaiian Sandalwood, Lavender Flower, Myrrh Resin, Helichrysum Flower, and Rose Flower essential oils. However!!!!! Good news, this month June 2017 if you place a 200 PV (point value) order of any kind....enrollement, one time or loyalty rewards order you will actually get this $92 bottle of essential oil for FREE!!!!! Let me know if you have any questions or need any help getting your FREE Immortelle.